If you are looking for a delicious and versatile hard toffee recipe that’s easy to make and won’t stick to your teeth, you’re in the right place! Just a few simple ingredients quickly come together to make one of the most addictive things I’ve ever eaten. Srsly! This toffee is perfect on it’s own, dipped in chocolate, or finely chopped to sprinkle between cake layers. This toffee is crunchy and crispy, never sticky and gummy. 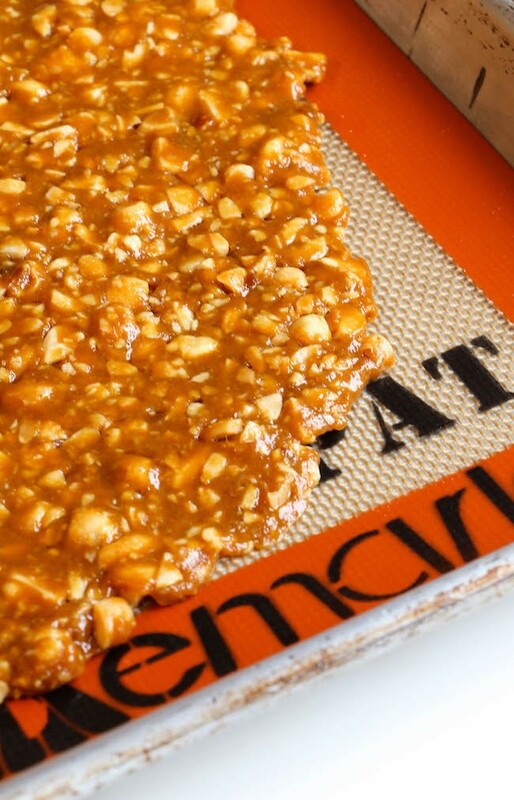 Make the toffee plain or add in your favorite nuts, seeds, or seasonings. In a small sauce pan, combine the butter, sugar, and salt. Cook over medium-high heat, whisking occasionally, until golden and bubbly, 5-7 minutes. Remove the pan from the heat and stir in the nuts or seeds and optional seasoning with a heatproof rubber spatula. Pour onto the prepared cookie sheet. Allow the toffee to cool completely before breaking into chunks or chopping. Store in an airtight container in a cool, dry place for up to 2 weeks. Makes about 2 cups of finely chopped toffee. If using in a cake filling, finely chop the toffee and sprinkle onto a cake layer that's been topped with buttercream or another creamy filling. Top the creamy, crunchy filing with another layer of cake. Peanuts, pecans, hazelnuts, sunflower seeds, pistachios, almonds, walnuts, unsweetened coconut, sesame seeds, macadamia nuts, or pumpkin seeds. Ground cinnamon, ground ginger, ground black pepper, dried herbs (thyme, basil, lavender, etc. ), cayenne pepper, ground nutmeg, curry powder, ground cloves.